It's been a pleasure. j 4 ( 185. NOT compatible with: Microsoft Xbox, Xbox One. 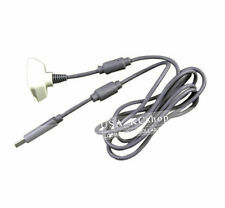 Getting power through USB port on xBox 360 console dispenses with the need of other power sources. Compatible with: Microsoft Xbox 360. ). Dual color indicator to show the charging status: Red-Charging lights, green lights. 1 x USB Charging Cable. Cord Length: Around 1.7 m. Never run out of battery again while you are about to attack your final score. Compatible with: Microsoft Xbox 360. Easy to connect and disconnect. Compatible with gaming devices that utilize breakaway connections. This cable will easily disconnect itself when to keep your Xbox from crashing to the ground in case. This adapter cable is simple and easy to connect and disconnect. Compatible with gaming devices that utilize breakaway connections. Extend, sit back and relax! 6 FT Cable (1.8M). Replaces Break-Away Cable. Compatible with:XBOX 360. 1 pcs cable. Length: approx. Nintendo Wii. 100% new and High quality. Nintendo 3DS XL LL. Nintendo 3DS. Dual color indicator to show the charging state 5 X USB Charging Cable. Charging cable length: 1.5 m approx. Work temperature: 0-70 Centigrade. Condition: New. 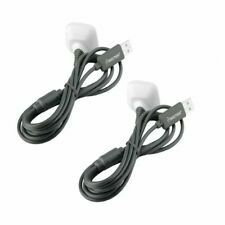 Genuine Microsoft Xbox 360 Controller Black USB Charger Cord Cable X816689-003. 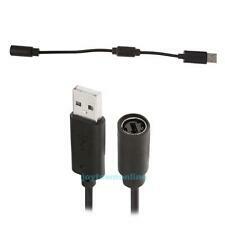 Genuine Microsoft Xbox 360 Controller Black USB Charger Cord Cable X816689-003.. Condition is Used. Shipped with USPS First Class Package. The item is a USB Breakaway Cable Adapter. Wired Guitars and Drums, Dance Pads & Any Other Gaming Devices that Utilize Breakaway Connections. Included:2 X USB Breakaway Cable Adapter. NOT compatible with: Microsoft Xbox, Xbox One. Dual color indicator to show the charging state Included: 1 X USB Charging Cable. Charging cable length: 1.5 m approx. If item is defective after 3 months, you can still send it back to us. We will send you a new one after receiving the defective item. Compatible Platform: Xbox 360, Xbox 360 Slim. Type: USB Charging Cable. Color: White. Weight: 8.00 oz. 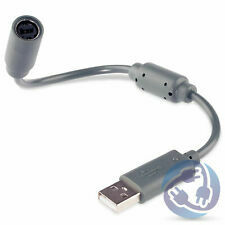 Genuine Microsoft Xbox 360 Controller Gray USB Charger Cord Cable. Condition is Used. Shipped with USPS First Class Package. Dual color indicator to show the charging state 1 X USB Charging Cable. Charging cable length: 1.5m/5ft approx. Work temperature: 0-70 Centigrade. 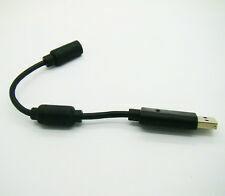 Microsoft USB 2.0 Data Sync Cable. 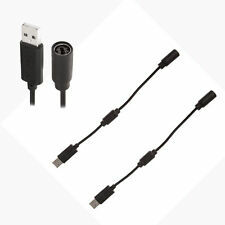 New generic USB breakaway cable for Microsoft XBOX 360. This product only works with Xbox 360, not any previous versions of Xbox. 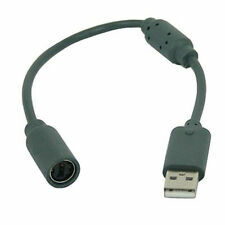 This cable is new in the bag and works on Xbox 360. Ferrite bead protects against RF and EM interference. Professional-grade shielding prevents against interference, and nickel-plated connectors resist corrosion while providing lightning-fast conductivivty! Compatible Platform: Xbox 360, Xbox 360 Slim. Type: USB Charging Cable. Trending at $4.67eBay determines this price through a machine learned model of the product's sale prices within the last 90 days. [This cable is new in the bag and Works on Xbox 360. This cable has USB on one end. This product only works with Xbox 360, not any previous versions of Xbox. We always make an effort to keep it upto date. ]. So you and your friends are having a great time playing the newest Rock Band on your brand new Xbox 360, when klutzy Karen trips over the rug and takes a fall. Unfortunately for you, she takes her guitar and your Xbox 360 with her! Avoid real-world calamity with a breakaway cable or two. This breakaway cable is compatible with Xbox 360 Rock Band- and Guitar Hero-wired guitars or drums, Dance Pads, and any other gaming peripheral that utilizes a breakaway connection. Next time Karen decides to take an impromptu fall, she won't force your Xbox 360 to take a stage dive with her!. Dual color indicator to show the charging status: Red-Charging lights, green lights. Dual color indicator to show the charging state 1 X USB Charging Cable. Charging cable length: 1.5 m approx. (4) Local pick up is not available. Work temperature: 0-70 Centigrade. Compatible Platform: Xbox 360, Xbox 360 Slim. Includes: 1 Xbox 360 Extension Cable. Reach across the largest of rooms without worrying about batteries or wireless connectivity. A/V Cable Connection: Not Applicable. Never run out of battery again while you are about to attack your final score. 1 x USB Charging Cable. Dual color indicator to show the charging state 1 X USB Charging Cable. Charging cable length: 1.5m/5ft approx. Color: Black. Work temperature: 0-70 Centigrade. Dual color indicator to show the charging status: Red-Charging lights, green lights. 1 x USB Charging Cable.